The radiance of the solar star inspires the Huaman Paucar Family to design their own version of the Intihuatana stone. Meaning 'Hitching Post of the Sun,' it is found at Machu Picchu's highest point. Some believe the Inca carved several of these stone outcrops to connect earth and sky; other's believe it was a way of tying Father Sun to his Inca children. 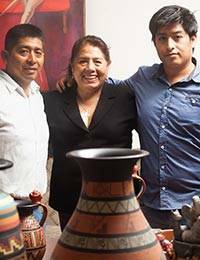 The Huaman Paucar Family honor this legendary emblem of Inca spiritualism with a handcrafted ceramic plate, which they paint with intricate detail. 3 cm H x 25 cm Diam.